A tender, mild flavored blend of leaf veggies for early spring salads. 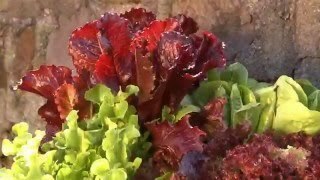 Mouth watering, time-tested heirloom varieties in red (Ruby lettuce, Bull's Blood beet) and bright green (Bloomsdale spinach, Simpson lettuce, Tendergreen mustard). Plant them and then pick them all together, starting when the leaves are about 3" long. As beautiful in the garden as they are sweet in the salad bowl. For optimum flavor, grow in cool weather after danger of frost. Mesclun will not germinate at temperatures over 80 degrees F.
Sow in average soil in full sun in mid spring for the first crop and again in late summer for a fall crop. When sowing in late summer, plant in a protected area when temperatures are below 75 degrees F.
In rows 12 inches apart, sow seed directly in the ground ¼ inch deep and cover with fine soil. Firm lightly and keep evenly moist. Or, broadcast the seeds in the bed. Plant every 2 weeks to extend harvest time. Thin gradually to stand 6 inches apart when seedlings are 1-2 inches high. Keep weeds under control during the growing season. Weeds compete with plants for water, space and nutrients, so control them by either cultivating often or use a mulch to prevent their seeds from germinating. Avoid disturbing the soil around the plants when weeding as plants are shallow rooted. Begin harvesting all mixes about 30 days after germination. When the plants are 4-5 inches tall, cut them about 1 inch above the ground, then water the bed with compost tea. Many mescluns will resprout in about 20 days and may be cut again. You can harvest entire plants as soon as they are large enough to be used, then replant the bed. After harvest, immerse in cold water, and then pat dry. Store in sealed plastic bags and refrigerate. Mesclun, Sweet Salad Mix is rated 3.4 out of 5 by 9. Rated 1 out of 5 by Nicknamealreadyused from Mustard Tendergreens Like another commented... That's all that came up for me too, Mustard Tendergreens. Yuck! Rated 3 out of 5 by granny13 from Slow to come up! Given the weather, it was slow in coming up, and sl;ow to grow! Rated 1 out of 5 by MCarmany from Hope you like mustard greens Bought and planted in my garden and several containers. Only thing that germinated and grew was the mustard greens. Pretty disappointing. Won't buy Burpee mesclun again. Had much better results with seed from other companies. Rated 5 out of 5 by Periwinkle Épée from Still going strong! I live in southwest Florida (aka hot as Hades) and these plants are doing beautifully still. Rated 3 out of 5 by littlehouse from So-so mix We live in West Virginia (zone 6b) and planted these seeds in the first week of April. Germination rates were great - I think around 90-95%. We ended up with lots of mustard greens and green/red lettuce (which, while good, aren't as exciting or flavorful as the other seeds in the mix). Spinach and beet greens were disappointing - slow growers, and the spinach bolted within a week of starting to grow true leaves, while the plants were still very small. We never ended up picking beet greens because they were so small - they're still in the garden, hopefully growing beet roots (though the tops are only ~3" tall, even at the end of July). 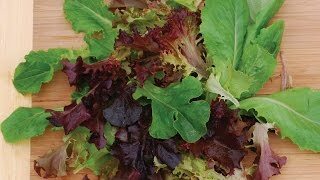 We won't be buying this mix next year - with only 3 of the 5 varieties growing well, I'll just piece together my own mesclun from varieties that grow better. Rated 4 out of 5 by nextyeargardener from Just Keeps Coming I planted this mix in mid April and I started harvesting mid May. I've taken at least 6 cuttings and the stuff just keeps coming back. The only thing I didn't like about the mix was the mustard greens so I just weeded them out. I'm growing 4 other types of lettuce and a couple types of spinach and this a great mix to have on the table. I will definitly be growing again in the fall. Rated 5 out of 5 by WillyNilly from Still producing! It's November 14th and I am still harvesting this wonderful lettuce mix! With a fairly mild fall so far my fall season has been extended. Fall is a great time to plant this mix. Seems like it's a little better in fall. I have been enjoying fresh lettuce since early September. I highly recommend this mesclun mix. I don't think enough people grow lettuce. It's a great return on investment as lettuces can be pricey. Can't wait to grow again next year! Rated 4 out of 5 by GardenCooker from fast and yummy this is the first time I grew mesculun and I found that this stuff grew so quickly in a windowbox that we were eating it in two weeks! it is also very sweet and is good for formal salads.